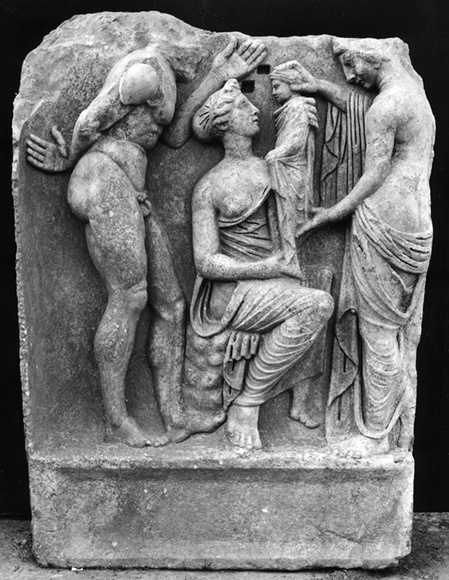 This article presents the first publication and discussion of an unusual sarcophagus from Aphrodisias that depicts the birth of Dionysos and the infant’s arrival at Nysa. The sarcophagus is remarkable, despite its battered appearance, as mythological frieze sarcophagi represent less than 1% of the total production in Roman Asia Minor, where thus far this sarcophagus imagery is unparalleled. However, even in the metropolitan production of Rome, where mythological frieze sarcophagi are commonplace, this narrative appears on few sarcophagi. I argue that the appearance of this mythological narrative at Aphrodisias pertains more to local circumstances and regional context than to the mythological frieze sarcophagi produced elsewhere.